The University of Canberra Capitals will play their first home game of the season this Saturday at the AIS Arena. They will be taking on Sydney Uni, having just played their season opener away game against the Melbourne Boomers on Friday. The iconic Canberra team will be led this season by Lauren Jackson, Abby Bishop, Kristen Veal, Jess Bibby and Coach Carrie Graf. With seven WNBL titles to their name, they are the most successful team in the history of ACT sport. Having brought together new and old team members in training sessions at their new University of Canberra headquarters, Graf is confident that the team is well-placed to a earn a record eighth title in the 2014/15 season. As part of pre-season preparations, the coach has even opened up her property in Shallow Crossing for a team bonding-session to welcome new players and work on game-play strategies. Aside from new players and aspirations to return the team to its former glory, the UC Caps are also pleased to launch a new mascot for the upcoming season and are partnering with FM 104.7 and the National Zoo and Aquarium to find her a name. 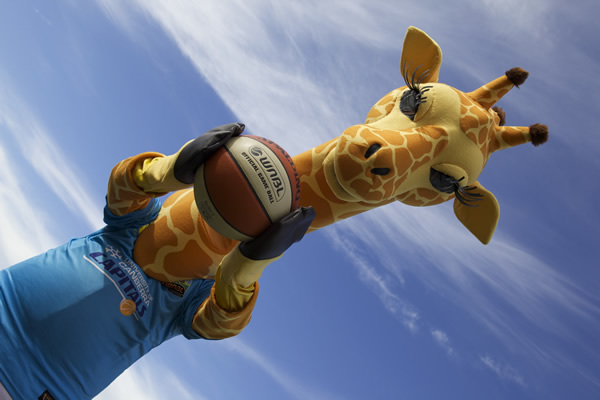 Standing eight feet tall, and listing dancing and dunking as her two main hobbies, the ‘Giraffe with No Name’ will be a welcome addition to the AIS Arena on game days for the UC Caps this season. “We wanted to have some fun with a new mascot, and every kid in Canberra knows Hummer the giraffe at the National Zoo and Aquarium, so now Hummer has a friend who we need a name for,” said UC Caps General Manager Lachlan Searle. The new mascot will appeal to kids in line with the club’s aim of creating an exciting atmosphere to help families engage with sports. Family ticket prices have been reduced to just $25, with the intent of becoming the best value entertainment option for Canberra families. Tickets are available through Ticketek. What do you think of the UC Caps’ new mascot? Will you be heading to the game this Saturday? Giraffes are a popular choice for kids I guess! The beer gut looks good. Brought to you by Healthy Harold, or Geoffrey the Giraffe?